In mitosis the nuclear envelope of the micronucleus becomes heavily and uniformly labeled with anti-b-tubulin which is not in the form of microtubules. 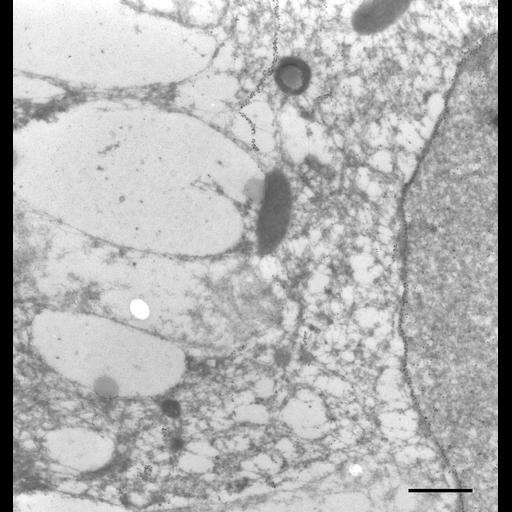 Some tubulin is also present inside the micronucleus. Apparently b–tubulin is being recruited to the mitotic micronucleus to form the spindle inside the intact micronucleus. Microtubules are present in the cytosol. TEM taken on 7/5/96 by R. Allen with Zeiss 10A operating at 80kV. Neg. 7,900X. Bar = 1µm. Cells were lightly fixed with 0.25% glutaraldehyde and infiltrated with 2.3M sucrose before being frozen in liquid nitrogen and thin sectioned at a temperature of –100°C at approximately 75nm thickness. Frozen sections from these preparations were then thawed, washed, and exposed to a monoclonal primary antibody that was raised in mice or rabbit/goat and to colloidal gold-complexed goat-anti-mouse/rabbit secondary antibodies. Further details of preparation are detailed in Methods Cell Biol. 2010;96:143-73. The negative was printed to paper and the image was scanned to Photoshop. This digitized image is available for qualitative analysis. An unprocessed, high resolution version of this image (CIL:38688) is in the library and available for quantitative analysis. Additional information available at (http://www5.pbrc.hawaii.edu/allen/).